This may seem like a polemic against Comcast, but it is really a tale of computer security, mixed in with issues of customer service, competency and courtesy. Comcast, the world’s largest provider of cable television and broadband Internet service, started out as a local cable TV company in Tupelo, Mississippi back in 1963. Over the years it has absorbed, merged with, combined, subsumed and taken over a vast number of cable television providers, cable television networks, and telephone service providers. In 2002, it merged with AT&T Broadband, striking off a huge chunk of the former Ma Bell and becoming the new Ma Bell of the cable world. It reigns supreme. Sometimes. Ma Bell was noted for professionally trained, well-groomed technicians, first-rate technology (my grandmother used the same Western Electric phone for more than 60 years), and rock-solid, reliable service. There were concerns about its virtual monopoly status, and if you did have a problem with billing or anything else, Ma Bell’s aloof bureaucracy could quickly kindle the flames of rage. Comcast seems to have inherited none of this legacy except the aloof bureaucracy. I’ve had problems with Comcast service on many occasions. When they came to install the cable, the “crew” consisted of one guy with a trowel; he “buried” the coaxial cable about an inch under the surface. It was severed and abraded any number of times by animals, lawn mowers, and erosion, requiring subsequent “crews” with their own trowels to come out, restring cable, and “bury” it under an inch of soil, over and over again. In September 2005, troubles started anew. While cable television seemed to work just fine, broadband Internet service fell off in both speed and reliability. Hours would go by with no service at all, and when service was restored, it was very slow: 50,000 bytes per second, about a tenth of the promised 600,000 bytes (six megabits) speed. I made numerous calls to Comcast customer service which were dismissed with misdirection (“There may be an outage in your area,” “The weather may be causing problems” [in this, the driest summer in area history?]) or misinformation (“We don’t support Macs,” “We don’t support Mac OS X 10.4,” “It must be a configuration problem on your end”) or outright bad advice (“We don’t work with firewalls. You need to get rid of that”). 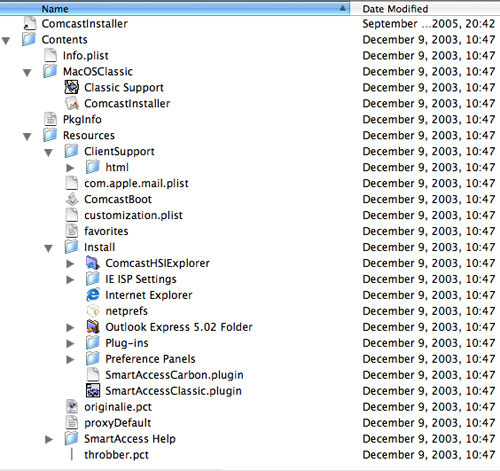 The ComcastInstaller had a nice, bright, if somewhat boring icon. But inside, it contained nothing I wanted or needed. Finally, one call was answered by a representative who quickly got to the point: “Your cable modem has reset itself 28 times today. Did you do this?” When I said no, he said it was likely the cable modem was dying, and scheduled an appointment. All I had to do was take off an entire day of work and a technician would fix the problem. The technician eventually arrived on the appointed day wearing torn blue jeans, a dirty shirt, and without evidence of recent bathing, shaving, or combing. After asking if I was “the Charters guy,” he then made a point of saying he “hated Internet calls. They’re always %$@*!” So much for a professional appearance and decorum. Over the next few minutes he proceeded to confess that he knew “nothing about *&@#$ing Macs,” he repeated his hatred for “#$%@&ing computers” in general, and he told me several times that his “&#$@*ing radio [cell phone walkie talkie] wasn’t working. He used a diagnostic device to determine that the cable was, indeed, working, and disappeared back to his truck to pick up another “$@#&ing cable modem.” If you subtracted the obscenities, his working vocabulary seemed to be limited to maybe 100 words. The Comcast technician had unplugged the Ethernet cable connecting my Mac to the firewall and plugged it directly into the cable modem. The cable modem, a Motorola SURFboard, is designed to then connect to a (Comcast? Motorola?) Web site via a proxy server, where the technician can then type in configuration information. But because his “#$@%&ing radio” wasn’t working, the technician didn’t know what to type, couldn’t contact anybody to ask, and instead he’d downloaded a file, and was attempting to install something on my Mac. My patience with his language was at an end, so I bluntly told the technician to clean it up. Then I looked at what he was trying to install, and shuddered. 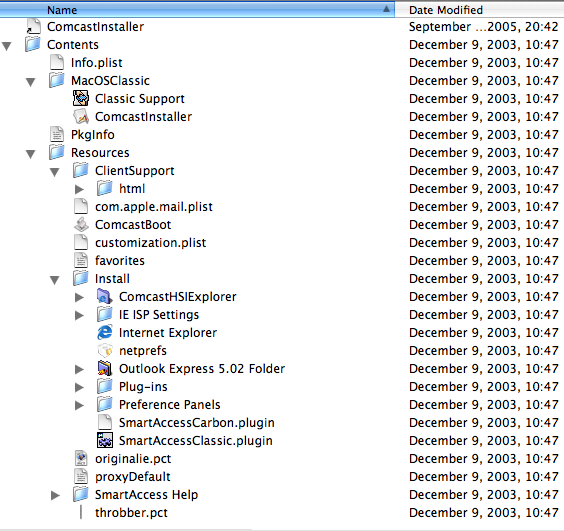 The file was a binhexed Stuffit archive containing something called the “ComcastInstaller.” Using Mac OS X’s Get Info command, I opened up the installer, and discovered it contained an outdated collection of obsolete software. How out of date? The downloaded file was compressed with Stuffit, an obsolete archiving protocol. Mac OS X 10.4 doesn’t even include a utility to open the archive; the ability to create and unpack ZIP archives is built-in to Mac OS X 10.3 and 10.4. If you did have a way of opening it, none of the included software even works with Mac OS X. All the applications were from Microsoft, and dated back to the previous century; the browser, for example, was Microsoft Internet Explorer 5.0, released for Mac OS 8.1 and 9 in March, 2000. By Option-clicking or right-clicking on the ComcastInstaller, I could select Show Package Contents, and see inside the installer. And all I saw was a desert: an expanse of obsolete software and scripts that, if run, would have greatly confused my poor, innocent Macintosh. I refused to let the technician install anything, and told him he shouldn’t need to install any software just to get the cable modem working. He disappeared out to his truck for 45 minutes, and during his absence I called Comcast’s technical support line and, with their aid, configured the cable modem and successfully connected to the Internet. What are the lessons to be learned from this encounter? Don’t assume a technician knows more about your computer than you do. Do insist that they be respectful, courteous, and civil. Don’t let a technician install anything to connect you to the Internet. Every Mac ships with a full suite of Internet applications, and the Software Update pane in System Preferences will keep you machine far more current than anything your ISP has to offer. In this particular incident, the problems were with Comcast. But they are not unique to Comcast. Gone are the days when technology-obsessed geeks staffed Internet Service Providers; today’s visiting technician may not even like computers. Most of them do troubleshooting through a script; venture off the page, and they are lost. Few understand the differences between Macs, Windows and Linux; some think they use interchangeable software. Most of them see essential safety features, such as firewalls, as obstacles. They’ve heard they are important, but don’t understand how they work, and “know” that things are easier without them. What should you do? You should learn, at a minimum, enough about your computer system, and how it connects to your ISP, to be able to troubleshoot problems. You should know enough to have confidence in challenging visiting technicians to explain themselves. You should know enough to refuse, outright, any attempt to install software on your computer, to refuse to provide them passwords to your system, and to refuse to try and reconfigure your software. If your connection to the Internet was working but isn’t now, changing your software, or allowing someone else to change it, is usually the worst possible idea. You don’t need to be a computer maven to be a good consumer.